One of the benefits of working in the video and photo industry that we appreciate most is the wealth of information to which we’re exposed during our productions. Even a trip to the landfill can be a source of revelation. Did you know that the Caterpillar graders, bulldozers and compactors that distribute the garbage truck deliveries atop a landfill include in-cab GPS devices that assist the operator in letting him or her know within inches how evenly distributed their layers of refuge are? As was explained to us by the plant operator, one of the landfill staff’s priorities is to make the most efficient use of the limited acreage they manage by ensuring that as much waste as possible is compacted within a given area. Lance Robson and I spent a full day at the North Central Landfill in Polk County, Florida shooting high definition video interviews and b-roll footage of the Caterpillar machinery in use at the facility. The footage is being assembled by Brush Art Corporation in Downes, Kansas to create a promotional short for CAT. 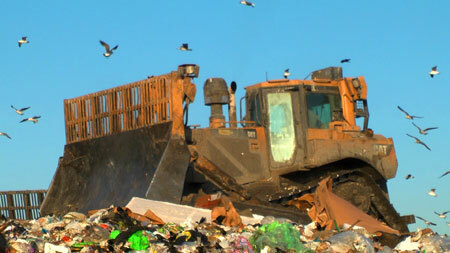 While a day at the dump may not sound like something to look forward to, I must say that we were impressed with the level of sophistication involved with running a modern landfill and appreciative of the well-designed, purpose-built machinery offered by Caterpillar. So, to all you budding photographers, videographers and journalists, don’t take for granted the knowledge that can be obtained on the job and don’t be afraid to get your feet dirty. We here at Digital Media Services are grateful for the wealth of information we’ve obtained while working on a projects…even at the landfill.